It's not often that we are introduced to a large new clade of stem-birds*, but a new paper by Wang et al. finds support for just such a thing among the enantiornithes. Named Bohaiornithidae, the family unites a few previously-known similar-looking opposite birds with two brand new species. 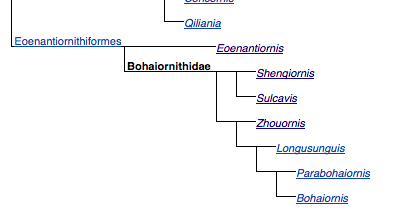 Phylogeny of Bohaiornithidae, modified after Wang et al. 2014.